Shot in black and white with no dialogue, ‘cleverness’ is this 1920s nostalgic film’s strength. 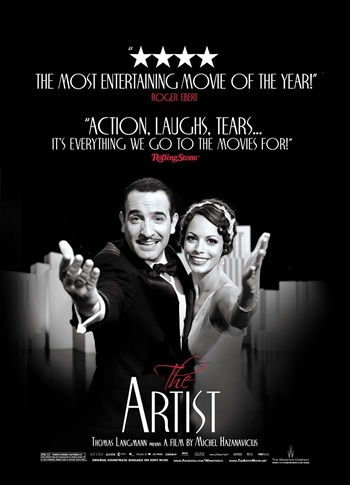 So many people have been asking me questions about its unique style, as “The Artist” is getting lots of award buzz. Here’s the repetitive burning question, “Is there really no talking?” The answer is yes, there’s basically no dialogue (except for a few lines near the end), however: the musical score, sound effects and written story details all compensate for the omission of human voices. The premise is simple storytelling at its best, with two talented stars whose personas appear eerily made-to-order for the 20s era. Add a scene stealing Jack Russell Terrier − and you’ve got a sure fire winner. Visually, the film is stunning with spot-on direction by Michel Hazanavicius, who’s also the screenplay writer. He’s a Frenchman who would be considered a newcomer by Hollywood standards, as he has limited film-directing credits. Perhaps one clue to the film’s success (besides its unique nature) may be the cohesiveness between the director and his two stars, Jean Dujardin and Berenice Bejo. All have worked together on prior projects with Hazanavicius stating that in 2005 he’d approached the two actors with the idea. The script was written with the duo in mind. Taking place in Hollywood, 1927, silent film megastar George Valentin (Dujardin) is having a tough time ‘getting on board’ with the idea of talking in film. He basically thumbs his nose at the studio and refuses to comply. While on the set of his last major silent film he meets a young, enthusiastic extra named Peppy Miller (don’t you love the name! ), and both are smitten from the get go. Valentin is in a failing marriage and soon his wife does leave. Valentin’s lavish home and furnishings along with a devoted chauffer (George Cromwell) are the hallmarks of his fame. Soon, those fade into oblivion and all that’s left is his dog (real name, ‘Uggie’) and the movie reels from his silent film days. Meanwhile, Peppy’s star has risen to new heights and she’s the one with the illustrious life-style, including Valentin’s prior chauffer. John Goodman shines as the cigar-chomping studio head. His expressions are occasionally priceless, as the facial expressions ‘have’ to tell the story. To say that both Dujardin and Bejo are incredible in this role using only facial expressions and gestures is an understatement. You can plainly see the themes of pride, love, fame and vanity. As far as humor − that’s where the adorable, scene-stealing dog comes in. Of course music plays a big role in the film and also serves to carry the story along. An orchestra plays while the silent films are shown and we are given a glimpse into what it was actually like to view a movie in this format. Also, the film’s extra cleverness is that as viewers, it’s as if we are watching a movie inside of a movie. The filmmaker’s inspirations are Alfred Hitchcock, Fritz Lang, John Ford, Ernst Lubitsch are F.W. Murnau. Hints of these filming techniques are peppered throughout. One particular driving scene has Hitchcock written all over it. In the tradition of Fred Astaire and Ginger Rodgers, there’s plenty of tap dancing and musical numbers to keep things lively. Hazanavicius certainly takes advantage of the silence. He uses scripted dialogue cards when necessary and other sound effects. We do hear music lyrics (“Pennies from Heaven”) mid way through the film and it’s incredible how they stand out, as we’ve heard no spoken word up until that point. The score is pitch-perfect, using the bass drum for drama and the flute as in the classic “Peter and the Wolf” for light-hearted scenes. On a side-note I was speaking with Zano Salon owner Denise Provenzano, who told me that she absolutely loved this film. It was her favorite of 2011. She also told me it was a pleasant experience seeing it in the movie theater as it was just so quiet. No loud explosions, gunshots, screaming or other distractions. She thought it was a refreshing change. Bottom-line: One of the year’s best films, clever, witty and charming, old-fashioned storytelling at its best.